Tribal Grooves and Combos for Intermediate and Advanced Dancers. 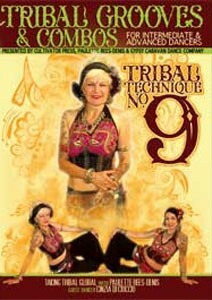 Learn more advanced combos and steps to add to your growing tribal bellydance repertoire. Enjoy dynamic and funky steps with variations on moves that you already know. Includes a Warm up, instructional section and two practice sessions. Paulette Rees-Denis and the Gypsy Caravan Dance company present their group improvisational style of tribal with Cinzia Di Cioccio and Les Soeurs Tribales as guest artists. Features music from Gypsy Caravan's CD Remarkably remixed.